Lalu Muhammad Zohri made sure the 100 meter finale at the World U20 Championships was a historic race to remember on Wednesday in Tampere, Finland. The Indonesian athlete, who turned 18 in July, won the country's first global title ever, according to a southeast Asian outlet covering track and field news, beating heavily favored American prep and U20 world leader Anthony Schwartz, who hadn't lost a single race at the distance in 2018 and held the world U20 lead. "This feels great winning a medal here in my first international meet against the best of the best," Schwartz said." I didn't get the result I wanted but I leave here knowing I still have a lot in me and still have the fastest time in the world. It's really a learning experience knowing that I can be beat. Being beat is actually the best outcome because I now know that I need to train harder." Operating out of Lane 8, Zohri had a stirring start out of the blocks, worked through his progressions and only got stronger in the final stretches, leaning toward the finish--in a remarkably close race--as he set a new personal record of 10.18 (+1.2) seconds, which also matched a new national junior record for Indonesia and a U20 best in southeast Asia. It also marked the first time a southeast Asian athlete won the 100 meter dash at the World Junior Championships. Schwartz was second in 10.19 seconds, while Ohio State's Eric Harrison was third. The win was so surprising that Zohri and his representatives didn't even have a flag ready following the historic win. Schwartz and Harrison both took a picture with Zhori as the American flag draped over their shoulders. But Zohri's breathtaking run to the finals may have offered the best glimpse of his majestic weekend. He looked confident in the preliminaries, winning his section on Tuesday in 10.30 seconds, then was second to Schwartz in the semi-finals on Wednesday, racing to a time of 10.24 seconds. His finals time was only .01 seconds off Indonesia's national record. 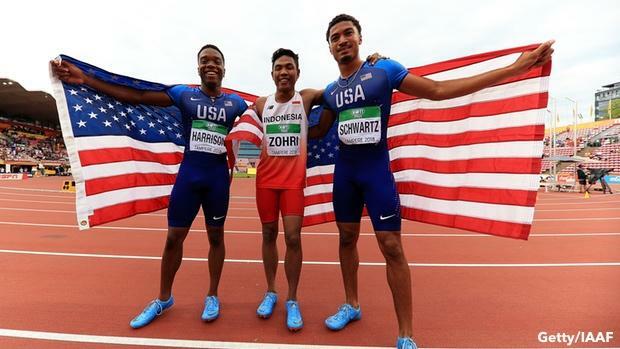 And though not signed to compete in an American college just yet, according to southeast Asian media, Zohri could potentially run in the states as early as next year. Lalu Muhammad Zohri proved once again that you should never underestimate the dark horse. The 18-year-old offered as the first EVER medal to Indonesia at the U20 #IAAFworlds. Not only did the men's 100 meter turn into a wildly memorable race, but the women's 800 meter might go down as one of the more disappointing turns from the Americans. Considered two of the front-runners for a title at the distance, Texas A & M freshman Sammy Watson and Bolles graduate Caitlin Collier both failed to advance to the final after coming up just short in their heats. Watson was fourth overall in Heat 1, getting beat to the line by Kenya's Jackline Wambui in 2:03.44. Watson was just five tenths behind in 2:03.95 and was the first qualifier out. Collier, meanwhile, was fourth in Heat 3, finishing in 2:03.95, which was six-tenths behind Japan's Ayaka Kawata. Collier had the fastest overall time heading into the U20 Championships, while Watson was a proven winter on the international stage and was coming off an NCAA Championship at the distance. Things got tighter as the men fought for a spot in the 110m hurdle final. Great Britain's Jason Nicholson came through with the fastest overall time, beating Jamaica's Damion Thomas by a few hundredths of a second in 13.32 seconds in Heat 3, though Thomas was the second automatic qualifier out of the section. Meanwhile, American Cory Poole managed his way to the finals after winning Heat 1 in 13.68 seconds. Oregon's Joseph Anderson, however, didn't fare as well, finishing fifth in Heat 2 and out of the final after his time of 13.68 seconds.